The LOGNORM.INV Function is categorized under Statistical functionsFunctionsList of the most important Excel functions for financial analysts. This cheat sheet covers 100s of functions that are critical to know as an Excel analyst. It will calculate the inverse lognormal distribution in Excel at a given value of x. We can use the function to analyze data that’s been logarithmically transformed. LOGNORMAL distribution is often used in financial analysisFinancial Modeling for BeginnersFinancial modeling for beginners is our introductory guide to financial modeling - we cover how to build a model, Excel formulas, best practices, and more. There are many types of financial models with a wide range of uses include: making business decisions at a company, making investments in a private or public to make investment decisions. It is often used in analyzing stock prices as normal distribution cannot be used to model stock prices. The normal distribution includes a negative side and stock prices cannot fall below zero. The LOGNORM.INV function is useful in financial analysis when we are given the probability and we wish to find the value of x. For example, we can use the function to know the probability of a stock price rising and want to find the stock price that is x. Also, the function is useful in pricing options. The Black-Scholes model uses the lognormal distribution as its basis to determine option prices. Probability (required argument) – It is the probability associated with the lognormal distribution. Mean (required argument) – It is the mean of In(x). Standard_dev (required argument) – It is the standard deviation of In(x). Remember, If p = LOGNORM.DIST(x,…), then LOGNORM.INV(p,…) = x. 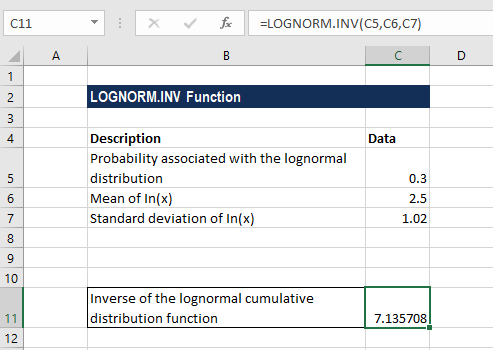 How to use Inverse Lognormal Distribution in Excel? The argument standard_dev is less than or equal to zero. #VALUE! error – Occurs when any of the given arguments is non-numeric. 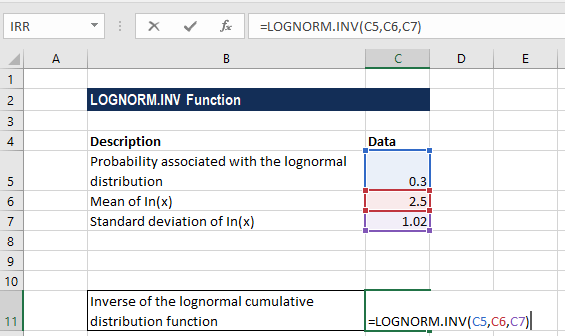 The LOGNORM.INV function was introduced in Excel 2010 and hence is unavailable in earlier versions. For older versions, we can use the LOGINV function. Work your way toward becoming an expert financial analyst by checking our Free Excel Crash Course. Learn how to use Excel functions and create sophisticated financial analysis and financial modeling.